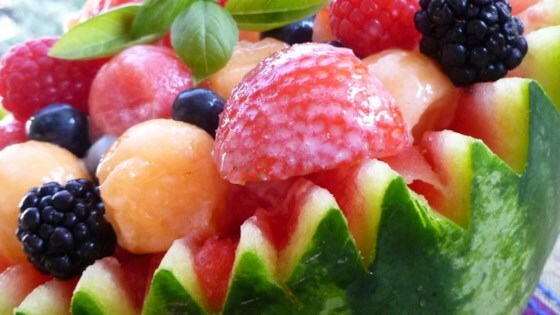 "This salad is perfect for summer BBQs. The fruit makes it tasty." I found this to be too sweet, and I felt it needed more fruit. It was pretty runny. I threw in some fresh blueberries. This was HEAVEN. We absolutely loved it. NO leftovers. Great salad for a hot day! I substituted blueberries for strawberries just so I didn't have to go to the store. It was heavenly! Made no changes to the recipe. Delicious! Wonderful recipe, but its just way too juicy and the fruit on the top crushed the fruit on the bottom- which is why its way too juicy.